It is any secret that Zeiss have been working on the "perfect" standard lens and today (7th of October 2013) the day came, when the lens were announced. Looking at the lens it isn't a standard lens that comes to mind, but one would think that it might be a medium telephoto lens that is attached to the Nikon or Canon camera. This tells you something about the size and weight of this lens. It is a monster compared to almost any of the other standard lenses that is available today. Looking at this list it is clear how big a monster this new lens is. If you want perfection then the Zeiss Otus 1.4/55 is the way to go, but you have to pay with a huge price. 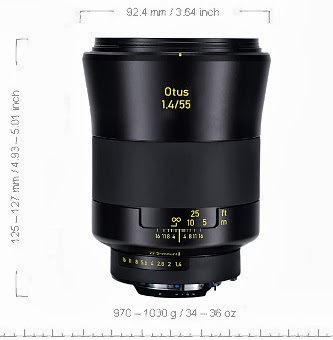 Follow the Zeiss Otus 1.4/55 at Zeiss Index.